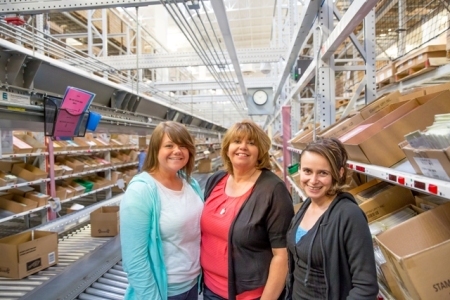 Congratulations to Connie--Our Million-Dollar Achiever! 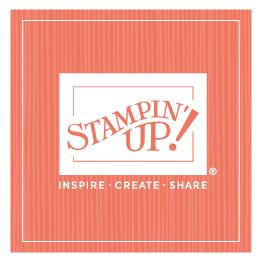 I’ve spent the last couple of days celebrating Connie Heisey, our fifth Stampin’ Up! million-dollar achiever. What a huge milestone for her to reach in her career—it was a pleasure to honor her and recognize her hard work and dedication. We kicked off the celebration with the home office visit on Tuesday. 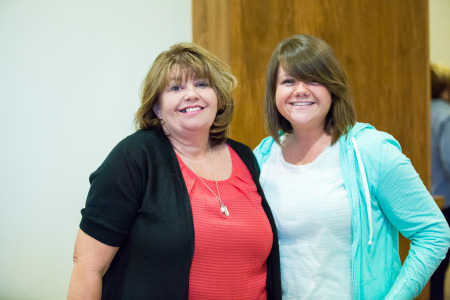 Connie and her daughter Heather arrived to an enthusiastic welcome from our home office employees, who met them in the atrium and applauded Connie’s incredible achievement. 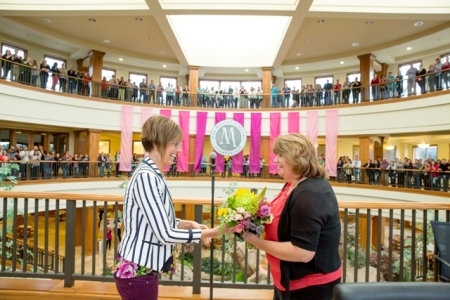 Connie received flowers and that exciting $10,000 check, then we all enjoyed a gelato treat (Connie’s choice) while employees got to interact with Connie and Heather personally, introducing themselves and thanking her for her great work. Next they both enjoyed a tour of the home office (especially memorable was seeing new product and getting to design a stamp set! ), and then Sara and I joined Connie and Heather for an enjoyable mother-daughter dinner at Valter’s, a nice Italian restaurant. Traditionally, the million-dollar achiever gets to choose an activity to do the next day; I’ve been honored that they have all opted to spend some time with me! When I talked to Connie, she too indicated she’d love to spend some personal time with me but instead of stamping she wondered if we could spend some time at Brick Canvas. Of course! Who wouldn’t love that, right? Connie sent a list of things she’d enjoy doing, and we made the appointments. It was a FULL day, and I hope a very enjoyable one! Connie also wanted to visit Dear Lizzy (she knows it’s one of my favorite boutiques), so Laura (the owner) graciously opened up early, and we started our day there. Next we headed for Brick Canvas, where Connie and Heather enjoyed a massage, facial, haircut and color, and makeover—what a great way to spend time together! I didn’t do everything with them but was always nearby, and we enjoyed lunch together at Fraiche. Sterling wanted to congratulate Connie as well, so he surprised us by showing up and joining us for lunch! 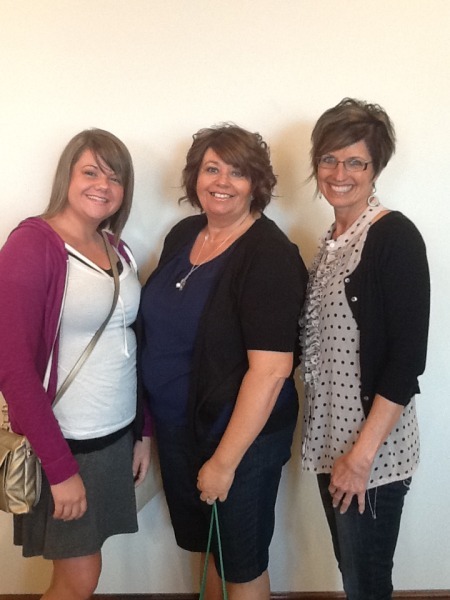 After the spa day, Connie and Heather were whisked off to dinner with a few of the Corporate Team members. Everywhere we went, people congratulated Connie on her amazing accomplishment (they all knew why she was here and what she’d done), so I hope she felt like she was the star of the day! I know we are all proud of her and so glad we are able to recognize her for all that she’s done as a Stampin’ Up! demonstrator. The highlight for me of the past two days is getting to know Connie and Heather better—that’s always what I enjoy most about these million-dollar visits. We talked some business (what she loves most about Stampin’ Up!, what she might change, what challenges she faces) and some personal (I got to see photos of her family and chat about the upcoming wedding), and I gained an even deeper respect for this amazing woman who has consistently built her business and made the most of the Stampin’ Up! opportunity! She’s incredibly positive and steady, and I am grateful for the opportunity to get to know her better!